Replaced the Slim Jim Guy with a Dave Mirra 2 model pack, Slim Jim Guy's included in the pack & hasn't changed since the last download so no need to download the pack if you only want him. Added Tony Hawk's Skate Jam soundtrack for THUGPro. This version has the songs directly ripped from the game's files with the original sound quality (no additional compression was done while converting to .bik). If you want a higher quality version of the soundtrack by Lego88fan, check it out here. Updated the Android Robot rig with some fixes/improvements. 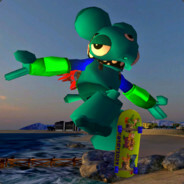 Are you going to make the Top Wing characters/skaters (like the cadets Swift, Rod, Penny, Brody, Speedy, and Bea) and the Big Swirl Island map as well if possible? Added a Dave Mirra 1 model pack. Contains the same characters & save files as the Mirra 2 model pack. Updated both Tails & Luigi with some fixes & stuff. That's a good rig idea lol. Idk how to get skins from that game into Blender though. Also, updated the Flanders rig. And i managed to extract/convert the Ronald McDonald into an .obj + .bmp for the texture, is that good ? Probably not since I just did that rig as a joke for the lols a couple years ago. I think someone else did a Bart rig a while ago at one point but idk where it can be downloaded now. Will download & take a shot at it eventually, currently working on a map port atm.